Tel-Tru™ Smoke Gun from E Vernon Hill produces hundreds of puffs of dense white smoke for air flow studies and leak-testing. This reusable, small-volume, portable smoke generator is the instrument of choice for Test and Balance experts the world over. Simply squeeze the rubber bulb handle on the Tel-Tru™ Smoke Gun to produce discrete puffs or a continuous stream of smoke. The gun combines titanium tetrachloride with moisture in the air to form a dense, persistent white smoke—perfect for tracking airflow patterns or performing leak tests. Four reload vials are supplied with each gun kit—each vial supplying 250 to 500 puffs of smoke. The breech plug on the glass body opens easily for refilling. Unused chemical can be saved in the gun indefinitely. 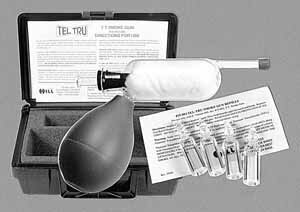 The Tel-Tru™ Smoke Gun Kit comes complete with one Smoke Gun, four reload vials, replacement cotton, instructions, and a high-impact plastic carrying case measuring 9.5" x 6.5" x 3.5". Caution: titanium tetrachloride is corrosive. Minute traces of hydrochloric acid will be released during use. Read and understand all safety information before use. The 15-092 TT Smoke Gun cannot ship by air. Ground shipping to the US, Puerto Rico and Canada, only. This information is provided as a guideline for the use and storage of Smoke Sticks. It does not replace a Material Safety Data Sheet (MSDS) as defined by federal OSHA requirements. Click here for Smoke Gun MSDS. The T-T Smoke Gun is intended for use in air movement studies. Specific uses include estimating air speed through animal pens or crates and determining inlet air flow and general air flow patterns. The dense white smoke produced by the Smoke Gun make it ideal for this application. The T-T Smoke Gun uses titanium tetrachloride to produce smoke. Titanium tetrachloride is an acid and must be used with caution. Follow all safety procedures. When exposed to moisture in the air, titanium tetrachloride reacts to form smoke containing small quantities of hydrochloric acid, titanium oxychloride and titanium oxides. Be aware of any problems that small quantities of these chemicals may cause in your specific application. Store products in a cool, dry place. Any moisture that comes in contact with titanium tetrachloride will cause the formation of smoke. Store the Smoke Gun and reload vials in the carrying case to prevent accidentalaccidental crushing. Exercise caution to prevent damage to or leakage from this product. Store in a secure place out of reach of children. Only those familiar with proper use and safety information should use the Smoke Gun. Do not store the Smoke Gun near equipment with metal or electronic parts. Corrosive acid fumes may cause damage over time. Use only in a well-ventilated area. If proper ventilation can not be provided, use a NIOSH approved acid gas respirator, with dust, mist and fume filters. Avoid inhaling smoke. Avoid contact with smoke. If skin contact occurs, wash affected area with plenty of soap and water. Abrasive soaps are most helpful. Eye protection should always be worn when using these products. If eyes are affected, flush with water and get medical attention. Do not take internally. In case of spill, flood area with water. Dispose of containers and unused titanium tetrachloride in compliance with local, state and federal regulations. The T-T Smoke Gun should not be stored or used around food or food products. Exposed food or drink should be discarded. Wash hands and face thoroughly before eating, drinking or smoking. Titanium tetrachloride is not flammable or combustible. However, if in danger of exposure to flame, the Smoke Gun and reload vials should be removed to a safe area to reduce the potential of breaking due to heat. 2/14/2010 – We are in Saudi Arabia, Jeddah. How we can buy this item. We are a pharmaceutical company.